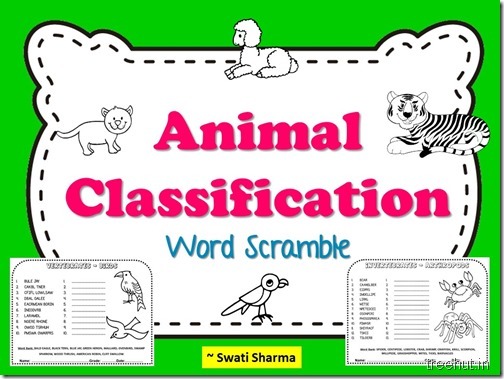 Animal Classification Word Scramble Worksheets has 16 pages. Has Word Scrambles on Vertebrates -birds, fishes, amphibians, mammals, reptiles. Invertebrates - insects, annelids, mollusk, arthropods, protozoa, crustaceans, arachnids, echinoderms. These Science Worksheets are apt for Grades 3 to 5. A great challenge activity after word searches. A good revision exercise or for early finishers. Includes pictures to color too :).